Stream discharge increases after heavy rainfall or snowmelt. But there is a delay in this increase because it takes time for the water to move into stream channels. The length of this delay depends, among other factors, on the size of the drainage basin feeding the stream. Larger drainage basins show a longer delay. 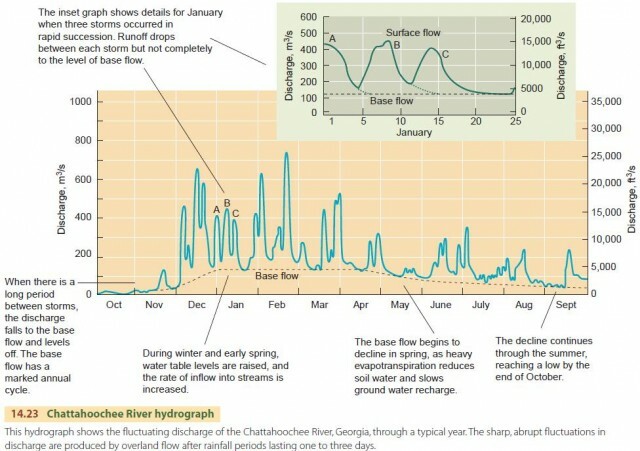 It’s easiest to look at the relationship between stream discharge and precipitation on a hydrograph, which plots the discharge of a stream with time at a particular stream gauge. 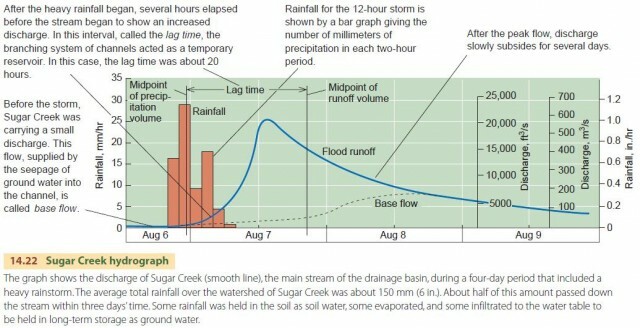 Figure 14.22 is a hydrograph for a drainage basin of about 800 km2 (300 mi2) in Ohio, with a moist continental climate. Comparing the timing of the midpoints of rainfall volume and the runoff volume, we see that the lag time for this hydrograph is about 20 hours. In general, larger streams have longer lag times. In humid climates, where the water table is high and normally intersects the important stream channels, the hydrographs of larger streams clearly show the effects of two sources of water–base flow and overland flow. 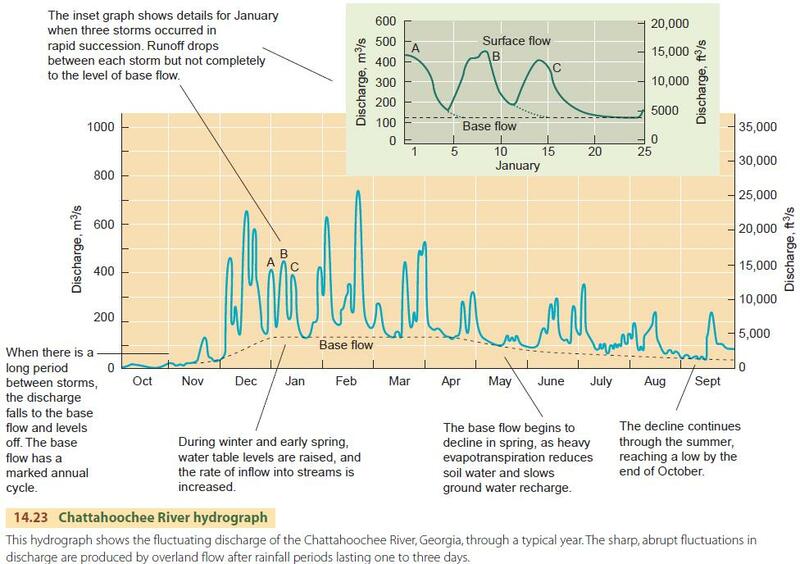 Figure 14.23 is a hydrograph of the Chattahoochee River in Georgia, a fairly large river draining a watershed of 8700 km2 (3350 mi2), much of it in the southern Appalachian Mountains. The growth of cities and suburbs affects the flow of small streams in two ways. First, it is far more difficult for water to infiltrate the ground, which is increasingly covered in buildings, driveways, walks, pavements, and parking lots. In a closely built-up residential area, 80 percent of the surface may be impervious to water. This in turn increases overland flow, making flooding more common during heavy storms for small watersheds lying largely within the urbanized area. It’s also harder to recharge the ground water beneath. The reduction in ground water decreases the base flow to channels in the same area. So, in dry periods, stream discharges will tend to be lower in urban areas, while in wet periods, the chance and amount of flooding rise. A second change caused by urbanization comes from the introduction of storm sewers. This system of large underground pipes quickly carries storm runoff from paved areas directly to stream channels for discharge. This shortens the time it takes runoff to travel to channels, while the proportion of runoff is increased by the expansion in impervious surfaces. Together, these changes reduce the lag time of urban streams and increase their peak discharge levels. Many rapidly expanding suburban communities are finding that low-lying, formerly flood-free, residential areas now experience periodic flooding as a result of urbanization. When the discharge of a river cannot be accommodated within its normal channel, the water spreads over the adjoining ground, causing a flood. Often the flooded area is cropland or forest, but sometimes it is occupied by houses, factories, or transportation corridors . Most rivers of humid climates have a floodplain—a low area bordering the channel on one or both sides. Annual inundation is considered to be a flood, even though it is expected and it doesn’t prevent crop cultivation after the flood has subsided. Annual flooding doesn’t interfere with the growth of dense forests, which are widely distributed over low, marshy floodplains in all humid regions of the world. The National Weather Service designates a particular water surface level as the flood stage for a particular river at a given place. If water rises above this critical level, the floodplain will be inundated. Once in 30 to 50 years on average, we see cases in which even higher discharges cause rare and disastrous floods that inundate ground well above the floodplain. Flash floods are characteristic of streams draining small watersheds with steep slopes. These streams have short lag times of only an hour or two, so when there’s intense rainfall the stream quickly rises to a high level. The flood arrives as a swiftly moving wall of turbulent water, sweeping away buildings and vehicles in its path. In arid western watersheds, great quantities of coarse rock debris are swept into the main channel and travel with the floodwater, producing debris floods. In forested landscapes, tree limbs and trunks, soil, rocks, and boulders are swept downstream in the floodwaters. Flash floods often occur too quickly to warn people, so they can cause significant loss of life. The National Weather Service operates a River and Flood Forecasting Service through offices located at strategic points along major river systems of the United States. When a flood threatens, forecasters analyze precipitation patterns and the progress of high waters moving downstream. They develop specific flood forecasts after examining the flood history of the rivers and streams concerned. The forecasts are then delivered to communities that might be affected.